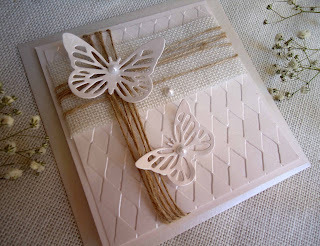 Butterfly wedding invitation in white tones. It's beautiful. Rustic Wedding Invitation with white burlap, jute twine and pearls. Embossed decorative front in brilliant wedding cardstock. Feel free to message us if you have any questions at all. We're always more than happy to help!